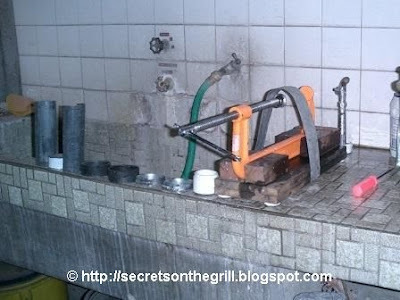 The basic workplace for making the briquettes would be a sink. A sturdy table with a good catch basin would be a good alternative. Shown below is the basic setup I have at home. It is essentially a sink made of concrete at our "dirty" kitchen. It sometimes doubles as a place to wash clothes. =) There is plenty of space at the side for the briquette equipment and the pail containing briquette ingredients. The concrete sink is deep enough for me to work on the briquette equipment without undue strain. There's space for the briquette equipment and the pail with briquette mix. It is sturdy enough for the briquetting process. 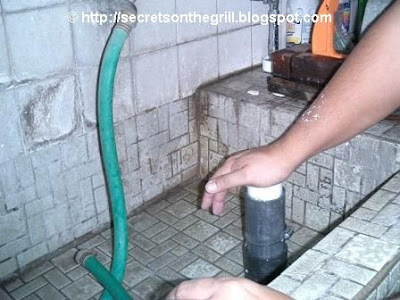 It can handle the water that comes out when making the briquettes. The next post in this series discusses the Briquetting Machine.